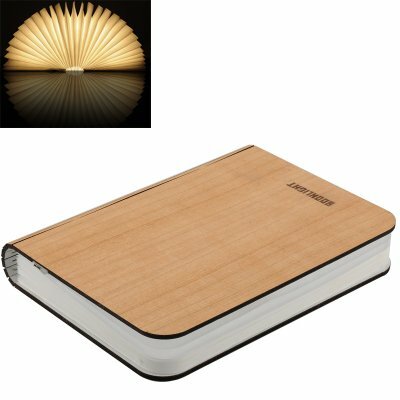 Successfully Added Folding LED Nightlight 'Booklight' - 5200mAh Battery, 500 Lumens, Up To 4 Hours Usage to your Shopping Cart. This novelty book shaped light and lamp has a 5200mAh battery casts 500lumens of light and is designed as nightlight or travel lamp. Looking just like a book this light needs no buttons, switches or wires and turns on by you simply opening it. With an LED light source and a 4 hour usage time you can open this “booklight” lamp and sit it by your bed as a night light. Being able to fold right back on itself means it can cast a light around 360 degrees and the magnetic peg ensures that it’s easy to setup and use. A long USB cable is included so you can charge this light from the USB port of your computer, laptop, powerbank or even via a standard USB wall adapter plug. Being made of plywood with a natural veneer finish makes it robust but also keeps it light and the tyvek lamp shade material is easy to clean with a damp cloth. This stylish and natural looking lamp makes the perfect gift for a book worm or night owl who may want to light up their evenings and with its own protective carry case its easy t transport so you can take it with you on your travels. This product is in stock now, we guarantee next working day shipping and offer a 12 months warranty on all our products. Brought to you by the leader in electronic devices as well as wholesale gadgets, Chinavasion.